Around the world, millions of you have been shining the spotlight on dodgy tax practices of some of the world’s biggest and most profitable companies. They have been draining hundreds of billions of dollars from developing countries - funds desperately needed for vital public services that transform lives, like schools and hospitals. ActionAid supporters used people power to demand companies clean up their act, and that governments change the scandalous and outdated tax rules that let it happen – and they’ve been winning! Here are some of the highlights of the last few years. But our work is not done. We must keep fighting for tax justice. ActionAid publishes its ground-breaking report Calling Time, showing that one of the world’s largest beer companies, SABMiller which produces well-known beers including Peroni and Grolsch, dodged an estimated $30 million each year in tax revenue – enough money to educate 1/4 million children. We met Marta, from Accra in Ghana. 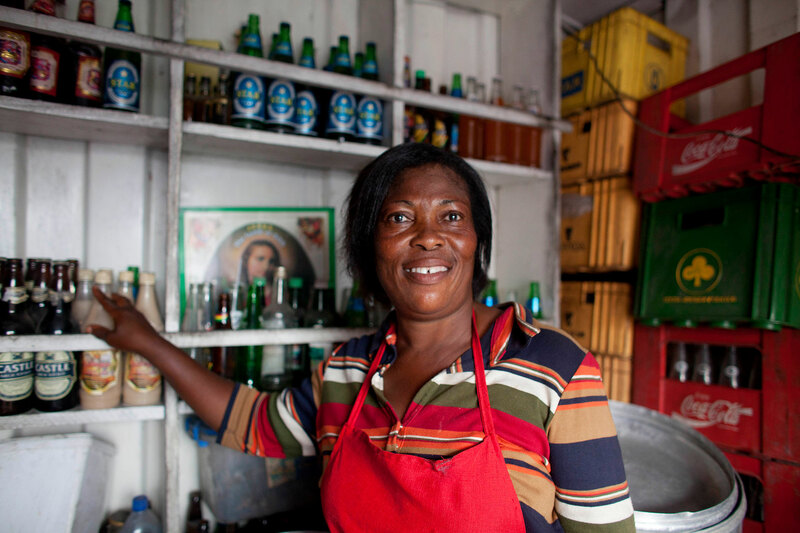 She sells SABMiller’s Club Beer from her small stall in the shadow of the brewery where it is made. In two years Marta paid more income tax than SABMiller’s entire Ghana operation. “Ten Green Bottles” protest in London, 2010. In Ghana, we worked with local organisations to provide training for journalists investigating corporate tax issues. 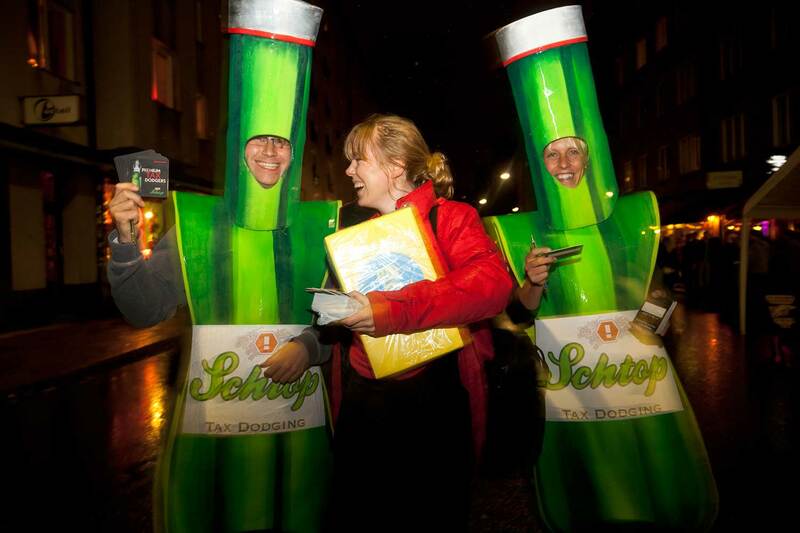 And in Sweden, ActionAid activists headed to Grolsch-sponsored parties dressed as beer bottles, distributing thousands of mock Peroni beer mats for people to sign and send to SABMiller. After wide-scale campaigning and reporting on SABMiller’s tax dodging, the governments of Nigeria, Liberia, Tanzania, Zambia and South Africa agree to share information on tax investigations, creating the ATAF Multilateral Convention on Mutual Administrative Assistance - the very first pan-African tax cooperation agreement! 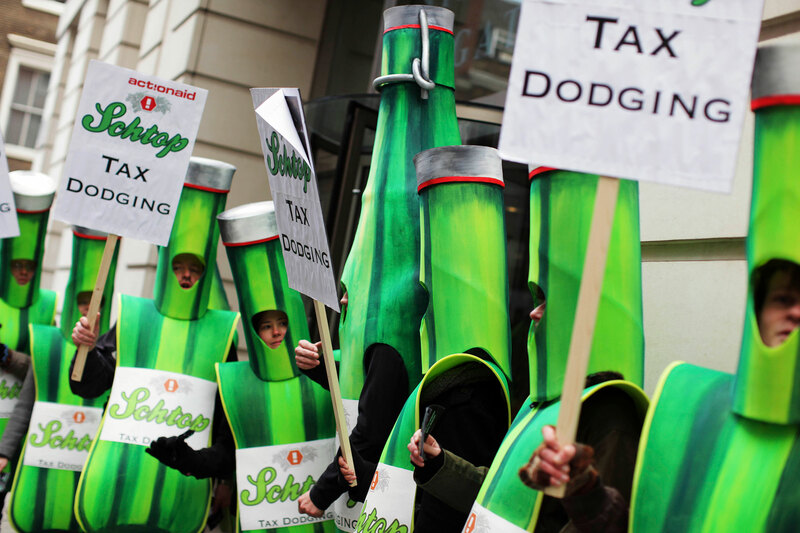 Activists in Sweden demonstrate on the streets about SABMiller’s tax dodging. Sweet Nothings, showed that financial engineering by Zambia Sugar, owned by British food giant Associated British Foods, cost Zambia $27 million in lost tax revenue between 2007 and 2012. 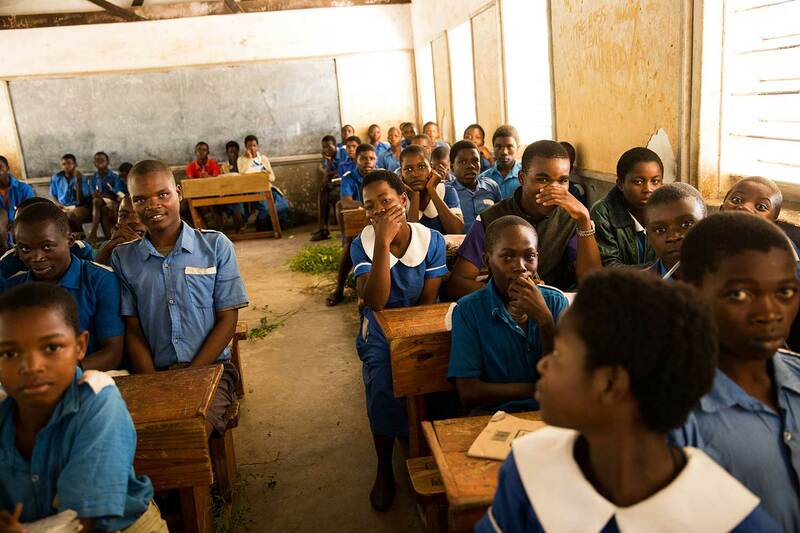 The lost revenue was enough money at the time to put an extra 48,000 Zambian children in school. 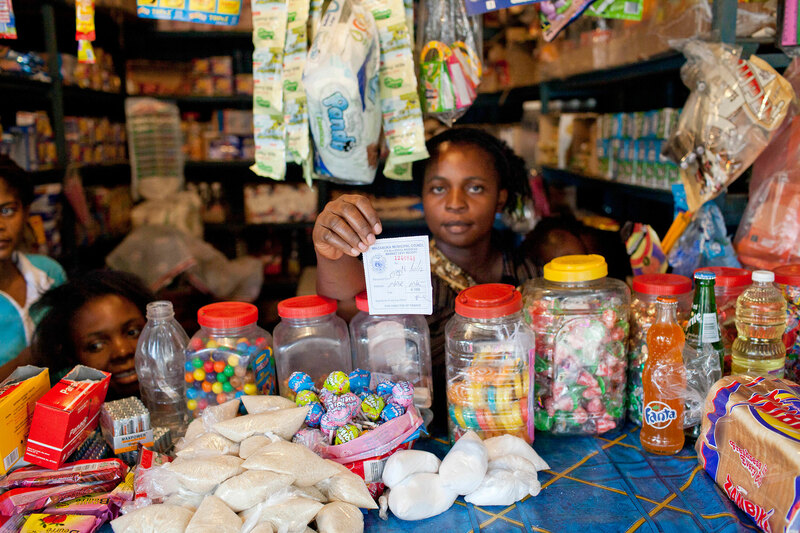 Caroline Muchanga showing her receipt for the market stall tax she has to pay. When we met Caroline she worked seven days a week at her market stall in Mazabuka, the site of Zambia Sugar’s factory. She could not afford to send her children to a decent school or get them adequate healthcare. In just three years, Caroline paid more income tax in absolute terms than Zambia Sugar. The Zambian government looked at ActionAid’s investigation into Associated British Foods and renegotiated its tax treaty with Ireland, one of the countries used by Zambia Sugar in its aggressive tax planning. The negotiation changed one of the clauses that had enabled tax avoidance. We continue to call on the Zambian government to make sure tax revenue is spent on helping children like Caroline’s to go to school. Our fight for tax justice goes global and ActionAid launches its Tax Power campaign across the world. Give us a Break revealed that developing countries give away an estimated $138 billion a year in tax breaks to multinational companies across the world. This money could meet global antipoverty goals to improve maternal health, finance agricultural programmes needed to end hunger and ensure education for all. 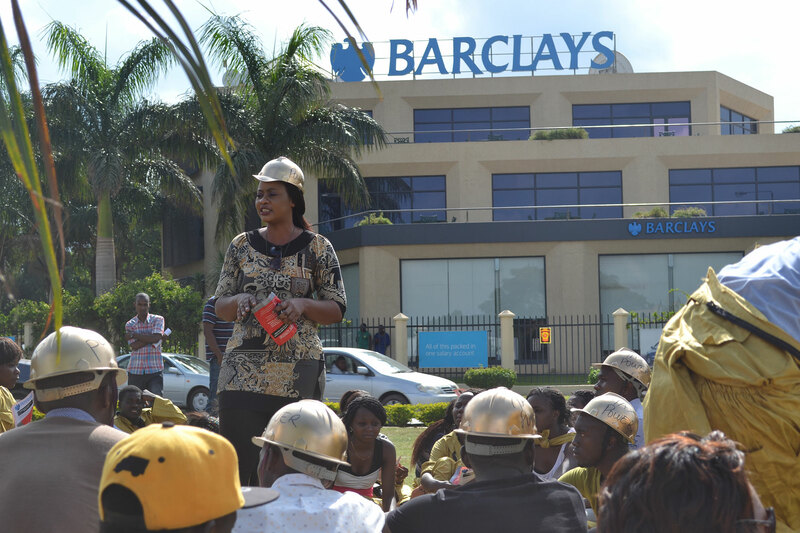 Barclays demonstration in Lusaka, Zambia. ActionAid reveals how Barclays, the British bank, promotes the use of tax havens via its Offshore Corporate department. Along with fellow campaigners, we put pressure on Barclay’s CEO, erected a billboard outside its Annual General Meeting, and held public protests outside their UK and African high street branches. Through sustained public pressure Barclays agrees to stop promoting tax havens to companies investing in Africa. A leaked video showed Anil Agarwal, boss of London-based mining giant Vedanta, bragging about big profits made by the company in Zambia at a time when its subsidiary Konkola Copper Mines was paying so little tax there. A Zambian audit found that copper sales to another Vedanta company in the United Arab Emirates were being under-priced. Protesters took to the streets in Zambia, and thousands of UK campaigners emailed Vedanta to demand they come clean about their opaque tax practices. 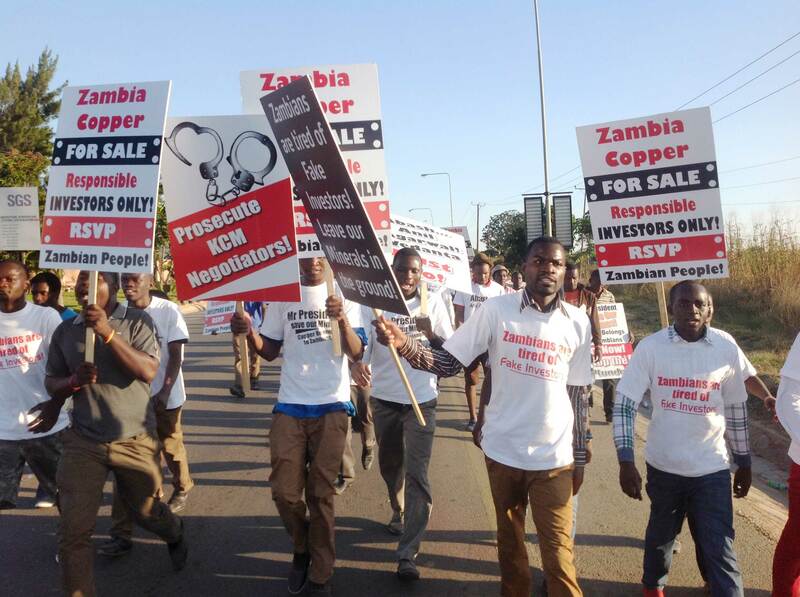 In Zambia we organised a protest march to the Konkola Copper Mine headquarters. Konkola Copper Mines, a subsidiary of Vedanta, later committed to making their tax affairs more transparent, and the revenue authorities in Zambia agreed to undertake a detailed audit of the mine. Blog post: (ActionAid) Is mining giant Vedanta dodging taxes in Zambia? 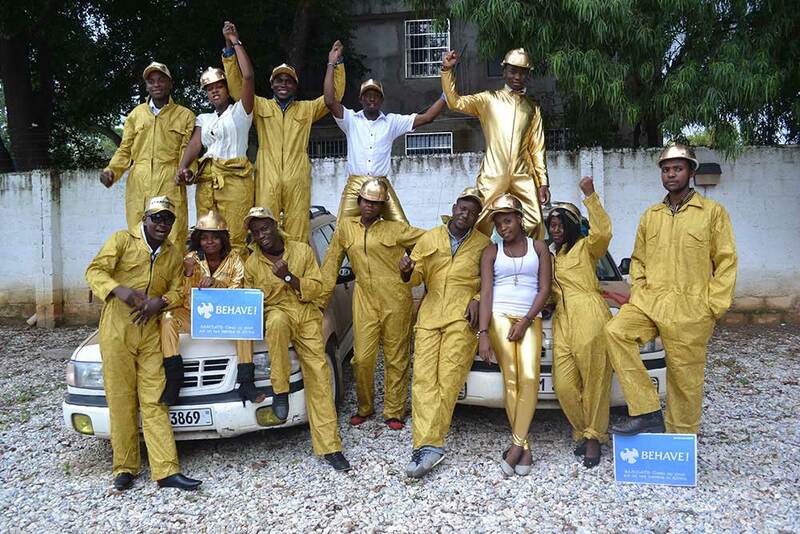 Tax campaigners celebrate in Ghana, 2014. Through years of campaigning, lobbying and increasing public pressure, we worked with partners in Tanzania to compel the Tanzanian government to reduce and better control the amount of tax breaks they give to multinational companies. MPs passed a new law stating that ministers can no longer give big businesses backroom tax deals. 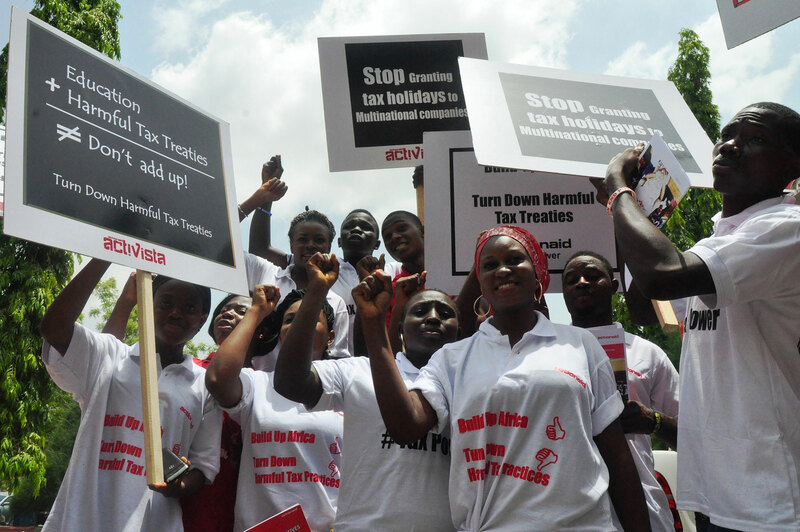 At the start of 2015, we brought together campaigners from across Africa, including young tax justice activists in Nigeria, to protest outside the African Finance Ministers meeting. Nigerian activists lobby African Finance ministers meeting. Six month later, and after years of lobbying from ActionAid and our partners, all of the African Heads of State committed to reduce harmful tax incentives and renegotiate tax treaties, in the African Union’s report on “Illicit Financial Flows from Africa”. Since then, tax justice activists across Africa are keeping up the pressure on them to deliver their promises. We revealed that Malawi, one of the poorest countries in the world, had lost out on an estimated $43 million in tax revenue from Paladin - an Australian uranium mining company. 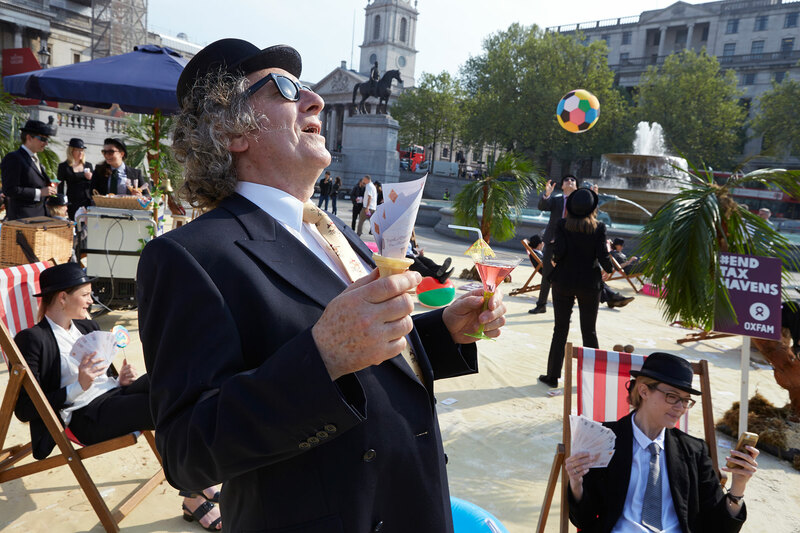 You wouldn’t put up with dodgy companies and wealthy billionaires not paying their fair share - activists in London demand an end to tax havens. 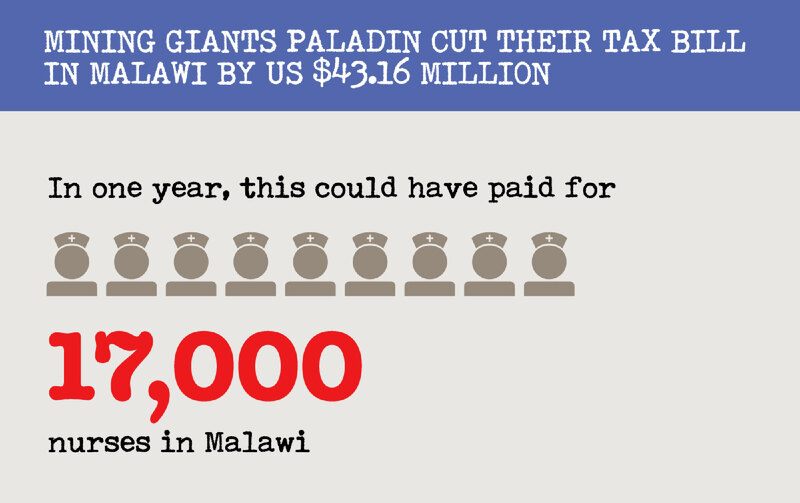 Paladin negotiated a tax break with the Malawian government. On top of this, it cuts its taxes further with big payments for management services to a Dutch company that has no staff. In one year this lost tax revenue could have paid the salaries of 39,000 teachers. Following ActionAid’s report, the Malawi government initiated a review of the Mines and Mineral Act to improve laws on tax incentives and tax avoidance. When companies dodge their tax, girls get hit hardest. When schools are underfunded, parentsoften choose boys over girls to be educated. 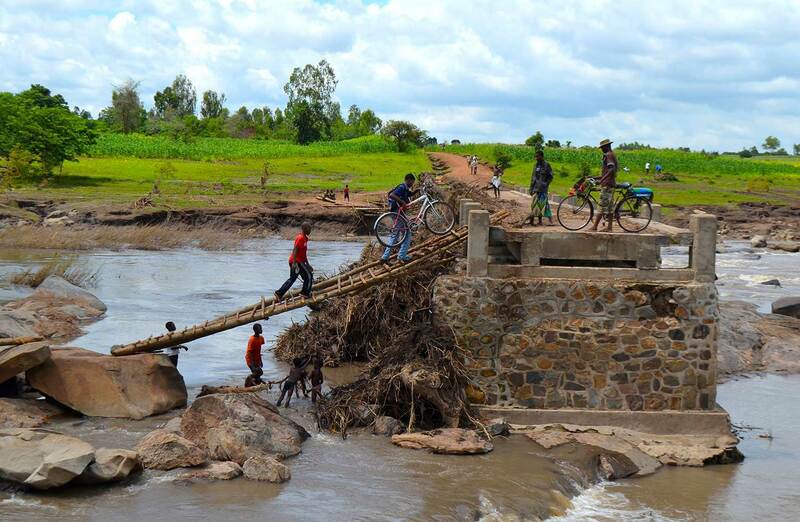 Children near Paladin Mine after floods in Malawi, 2015. The G77 group of developing countries stood up to demand a new global tax body at the UN conference on Financing for Development. 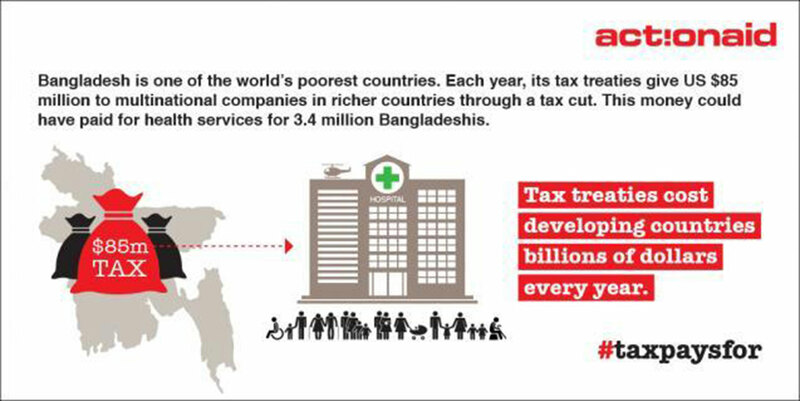 This was the first time tax has been so prominent as a way to fund global anti-poverty goals. Unfortunately, the developing nations bowed to pressure from rich and powerful countries and stood down in their demands to create a global tax body. 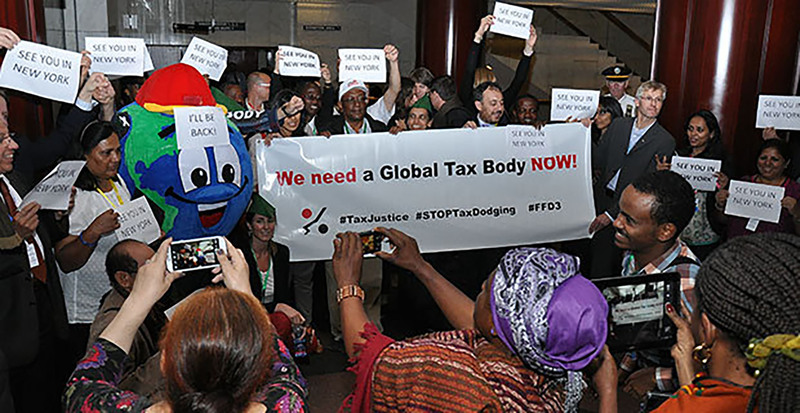 Activists from Africa, Asia, Europe and Latin America unite to demand new global tax body that can help stop the scandal of rampant global tax avoidance. ActionAid and other tax justice activists massively helped the push for a global tax body by holding a global week of action, standing in solidarity with poor nations and holding rich nation to account for their poor tax practice. The fight continues. 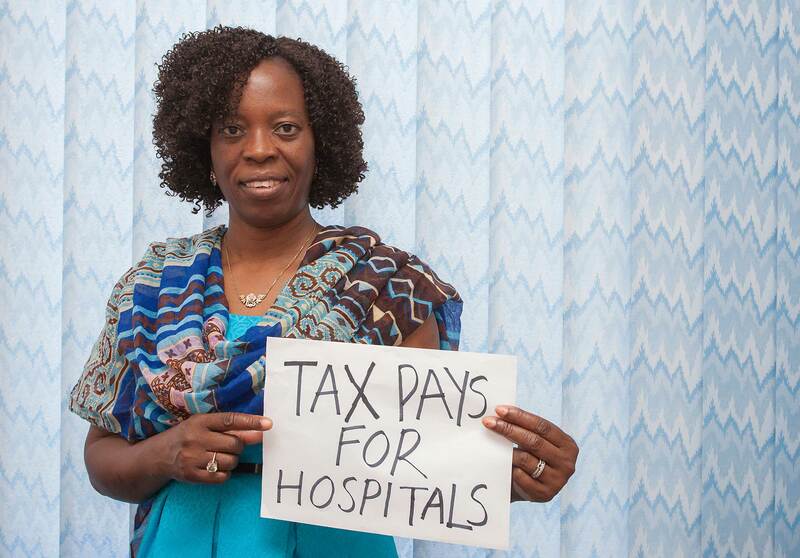 which could be paying for healthcare for Malawians and decent wages for nurses. In early 2016 we released our next report, Mistreated: The tax treaties that are depriving the world’s poorest countries of vital revenue. 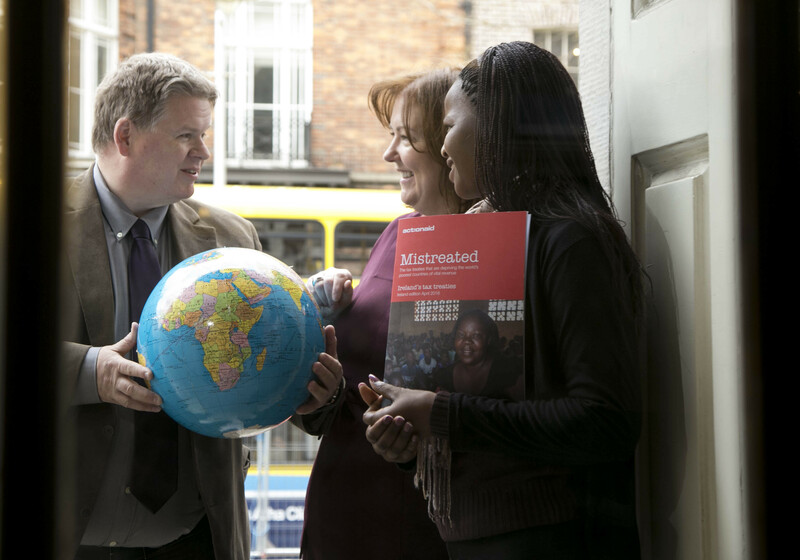 Launch of the “Mistreated” report in Ireland, 2016. For the first time, the global tax treaty system was exposed to public scrutiny, revealing how these treaties can support the flow of untaxed funds from the world’s poorest nations to the world’s richest. The release provides detailed analysis of the rules in more than 500 treaties. The release revealed that Bangladesh loses an estimated $85 million annually from just one rule in its treaties. At the launch event in Dhaka, several high-profile people including the National Board of Revenue former chairman joined us in asking the the government to review the country’s treaties. 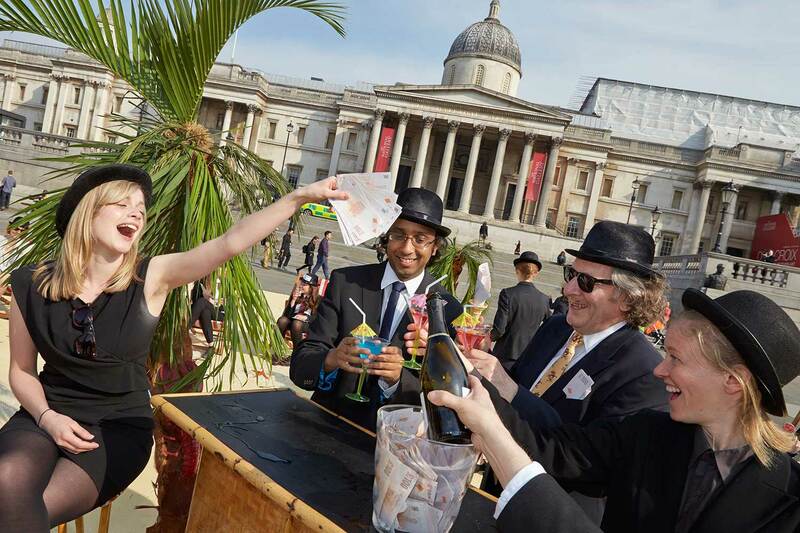 End Tax Havens Stunt in Trafalgar Square, London 2016. As the world reacted to the Panama Papers scandal, our campaigners in Uganda and Denmark told politicians to clean up the filthy tax system. 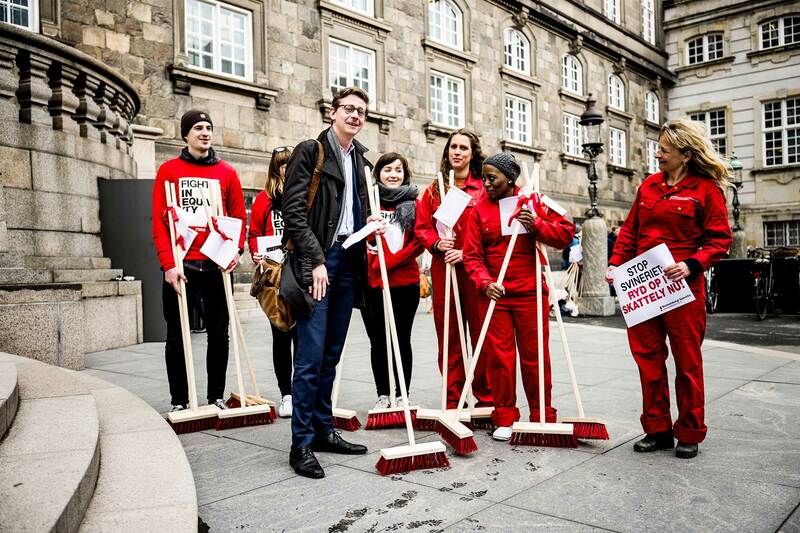 “Clean Sweep for Tax Evasion” demonstration by Danish activists. Meanwhile, young tax activists from Zambia, Malawi, and Nigeria toured Europe to speak with citizens, MPs and the media about how the actions of European multinational companies and governments were hurting their countries. “Tax Justice for Women’s Rights” parliamentary briefing in Ireland with visiting tax justice advocates from Zambia, Nigeria and Kenya. Ending with an event at the European Parliament, campaigners presented their petition on tax transparency to the Members of the European Parliament. British companies working in Malawi get away with paying hardly any tax because of a colonial treaty that was signed in 1955 on behalf of Nyasaland, South Rhodesia and North Rhodesia - countries that don’t even exist anymore! 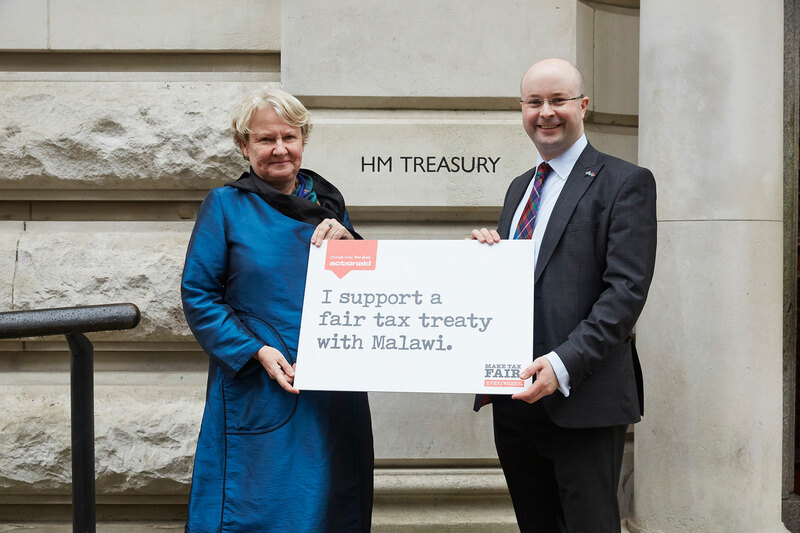 We campaigned furiously to end this unfair tax agreement, which would enable Malawi to better fund its public services. 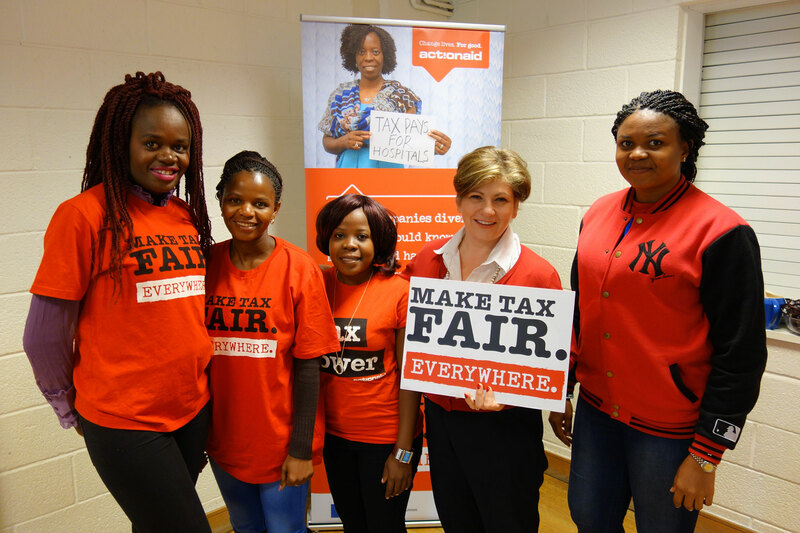 The “Make Tax Fair” events tour in London 2016. Thousands of British citizens and over 50 Members of Parliament supported the treaty to be changed. The UK government is now looking at the impacts of its tax treaties upon the world’s poorest. 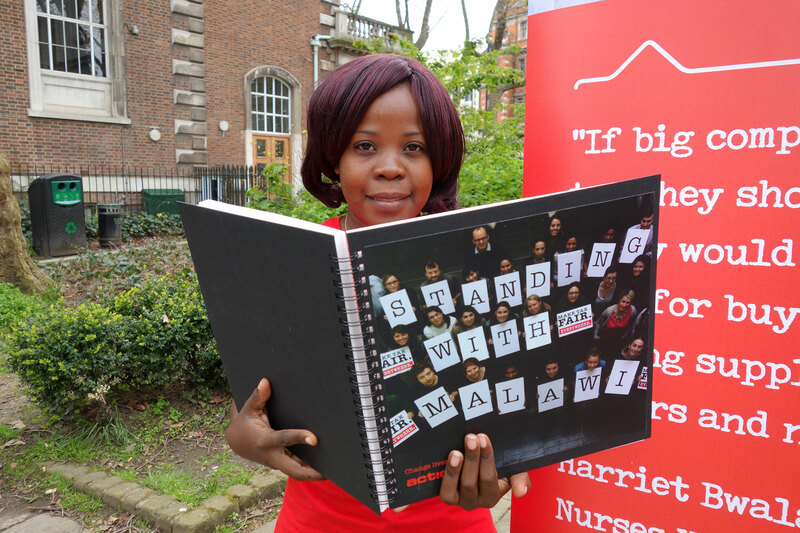 Malawi tax treaty petition hand-in at the Treasury in London 2016. On the International Day for the Elimination of Violence Against Women and Girls, we launched the report Freedom to Move, which showed how tax could help pay for public transport and street-lighting to make cities safer for women and girls in Bangladesh, Brazil and Nigeria. In Nigeria, women from the city and young activists took to the streets during rush hour with banners and a mascot to protest. As a result, the Transport Minister, and the Abuja Urban Mass Transport Company, agreed to address the problems. Activists in Nigeria continue to push the government to deliver their promises. 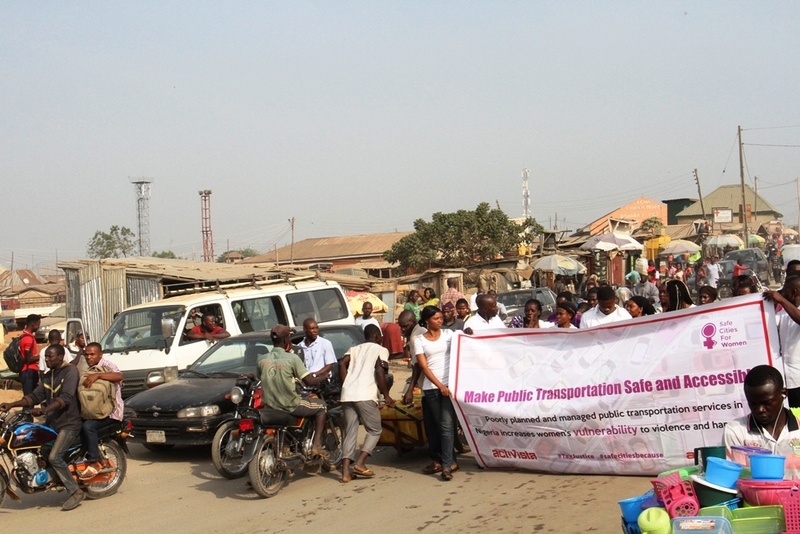 Nigerian street protest demanding safe and accessible public transport. 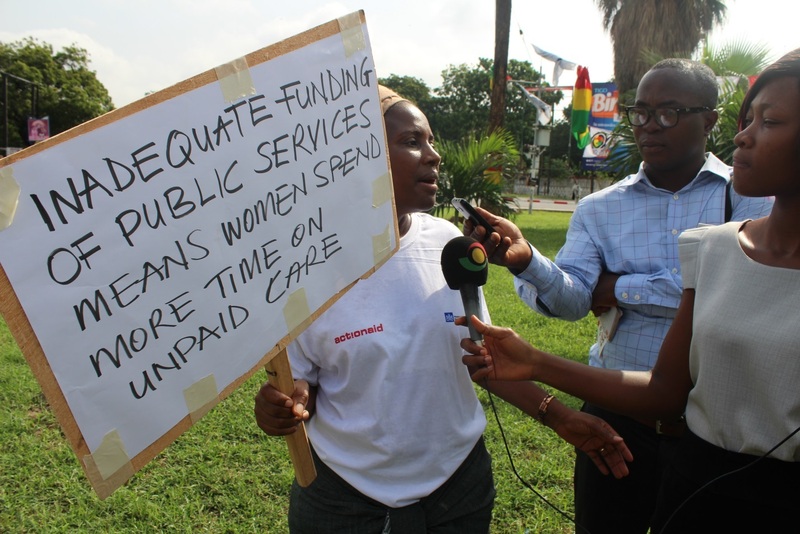 Women around the world demand tax justice for women’s rights - putting pressure on multinationals to pay their fair share of tax and for governments to make a global tax body. 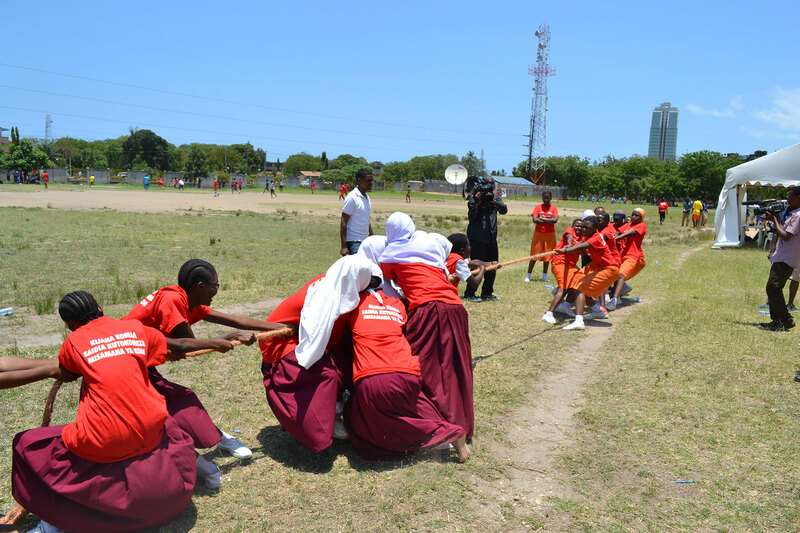 Progressive taxation could pay for girls education, safer public transport to reduce violence against women and girls, and for public nurseries that free women’s time. Tax justice week of action in Ghana, 2017. When governments met at the world’s most important conference on women’s issues, the UN Commission on the Status of Women, our partners put these demands to the UN Secretary General, and convinced governments to agree to having more progressive tax policies to fund women’s rights.